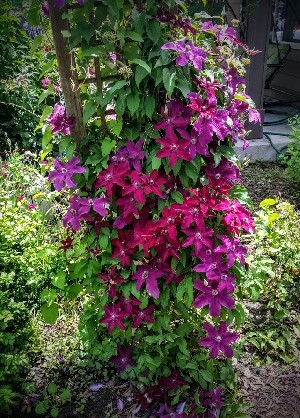 Large rounded, very rich Red purple Flowers with deeper red anthers.Early blooming and free flowering.Westerplatte is my heaviest flowering red tone clematis. Here in my display gardens I prune it as a type 3. It rewards me with so many vines that I have to thin some out. This is a great performer!